Summer is on the horizon. But before you escape to the lake, you'll need to swap out your wooly hats and fleece vests for light knits and breathable cotton. The wardrobe shuffle from winter to summer clothing can be a nuisance, but it also presents an opportunity to start out the new season in unwrinkled fashion — literally. Here's are the most efficient ways to get your closet fit and summer-ready. Now that you've sorted out your wardrobe rejects, consider how to make best use of them. Here are some ideas: Gift them to friends who appreciate your style, sell them through an online consignment shop, such as thredUP, or donate them to a charitable organization near you, such as Goodwill or The Salvation Army. Don't forget that you can claim any charitable giving on your taxes, so be sure to keep records of any donations. Now that you've purged the unwanteds, gather and neatly fold all your out-of-season clothing — corduroy, sweaters, boots, wool scarves, long johns, etc. — and place them in whatever storage space you have available. That space might be in the attic or a trunk at the foot of your bed. Or maybe your closet is equipped with ample shelving for storage. If you're coming up short on space, consider lofting your bed or raising it on risers and then using this created under-the-bed space to store clothing in sealed containers. Affix hooks and hanging rods on the inside of your closet door as well as your closet's back and side walls. In addition to clothing, these extra hanging spaces will make nice homes for your giant straw hats and beach bags. Hang your most-used items on those hooks and rods that are most easily accessible. Save the once-in-a-blue-moon wears for the hidden hangers in hard-to-reach places. If the few extra hooks and rods you've added just aren't cutting it, consider investing in an adjustable extender rod. Not only will it double your hanging space, but it will also give you an easy way to separate tops and bottoms — helping to keep your threads organized. Tis the season of t-shirts and tank tops — items that are notorious for gobbling up hanging space. But the thing is, these easy, breezy summer wears don't need to be hung. You can keep most tanks and tees wrinkle-free by storing them in neatly folded stacks. To keep these stacks organized, you're going to need a set of shelf dividers. Store your least-used tops at the bottom of each pile. Place your go-to gear on top. 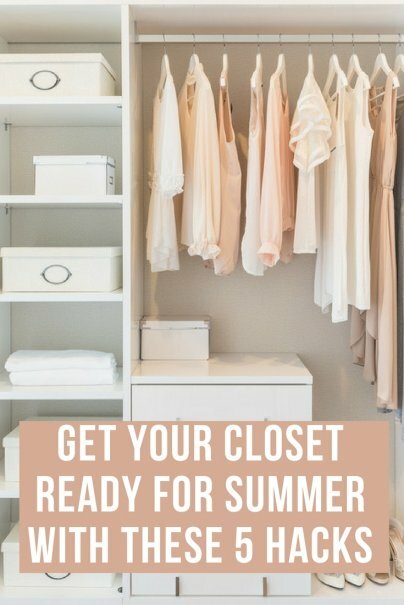 What are some other ways to get your closet in tip-top shape? Share with us!